Contain aromatic therapeutic oils and Bio-Organic Mineral Complex. Activate all vibrant functions of the body and boost its tone. They have very subtle and tender aroma that will stay on your skin up to 24 hours. Contains aromatic therapeutic oils and Bio-Organic Mineral Complex. Activates all vibrant functions of the body and boost its tone. This deodorant has a very subtle and tender aroma that will stay on your skin up to 24 hours. Dead Sea Mud Mask is a unique blend of Dead Sea mud and other natural ingredients cleanses, detoxes and revitalizes skin. Diminishes wrinkles, age and sun spots; hydrates, brightens and moisturizes skin for increased radiance. 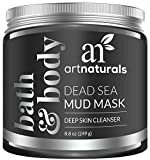 Art Naturals’ Dead Sea Mud Mask is infused with shea butter, kaolin clay minerals, sunflower oil, jojoba oil, aloe vera juice, and hickory bark extract to condition and heal skin. Skin superfood shea butter is naturally rich in vitamins A, E and F, providing UV ray protection and soothing the skin with essential fatty acids and the nutrients necessary for collagen production. Kaolin clay boosts blood circulation to the skin while balancing its oils. Sunflower oil, rich in Vitamin E and Omega-6, moisturizes, protects and turns back the clock on the signs of aging. Jojoba oil is full of natural fats similar to skin’s own and known to as a great acne fighter. Aloe vera juice calms and plumps skin, while hickory bark extract adds germ-fighting power. The unique formulation works together to improve your skin’s complexion, minimizing and cleaning pores, fading fine lines, removing blackheads and acting as a natural remedy for dry skin. Unlike cheap mud masks, Art Naturals’ Dead Sea Mud Mask is like bringing the spa home in a jar- at an affordable price! You’ll get all the benefits of blackhead strips and charcoal masks combined in one easy-to-use, luxurious product. Art Naturals’ Dead Sea Mud Mask helps to improve the elasticity of your skin and to reduce signs of aging, as well as improving blood circulation to reduce the appearance of cellulite. Skin is your body’s largest and fastest-growing organ, but the top 18-to-23 layers of your skin are made of dead cells, which need to be replaced in order to stimulate new, young cells. The Mask makes it easy to refresh, reinvigorate and renew healthy skin in the comfort of your own home.